Konami has announced that the legend himself, Johan Cruyff (he even has a technique named after him, for the youngsters among you wondering who he is) will soon be joining the ranks of PES 2018. He won titles all over Europe during his career, including the European Cup (well before it was re-branded as The Champions League) and even won the Ballon d’Or several times. Given the partnership between PES and FC Barcelona, it’s no surprise that he is to be digitally immortalised in their classic colours. He won the league with them on the pitch, plus four times (in a row!) as manager. Konami has released a trailer today, to commemorate the announcement. 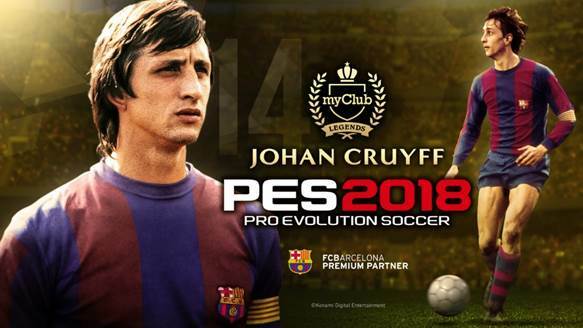 You can look forward to seeing Johan Cruyff in action soon, when he joins PES Club Manager on Mobile and Pro Evolution Soccer 2018 on consoles, mobile and PC.